The crockpot is our not-so-secret weapon. We use it at least once a week, and it saves us time during the busy work week, so we can enjoy each other’s company after work one night and have leftovers for lunches or dinner another night during the week. The best part is probably coming home to a house that smells like someone spent the entire day in the kitchen. It is so comforting and relaxing to come home to dinner being ready to be served. One of my favorite things to make in the slow cooker has turned out to be crockpot beef roast and veggies. It is great because you can take a little bit of a tougher cut, or whatever is left in the freezer in our case, let it defrost, and then toss it in the crockpot with some bone broth, spices, and veggies, and you’ll be pleasantly surprised by how tender and juicy it turns out to be. It is kind of like pulled pork and stew got married, and those are two of my favorite things. I can’t think of a better marriage of my favorite meals actually. Anyway, it is simple, fresh and flavorful….and super easy to pull together. 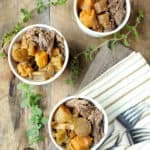 It is a no-brainer; you need to add this crockpot beef roast and veggies to your meal planner, and put it on repeat. It is also very convenient that your entire meal is done in the crockpot. All of your meat and veggies in one pot, ready to be plated and eaten the moment you walk in the door. Only one real dish to wash is pretty fantastic, too! We usually throw onions, sweet potatoes, carrots, and celery in with our beef, but you can use whatever fresh veggies you have on hand. Mushrooms would be good; we’ll have to try that next time. Or you can try it, and let us know how it goes in the comments below. 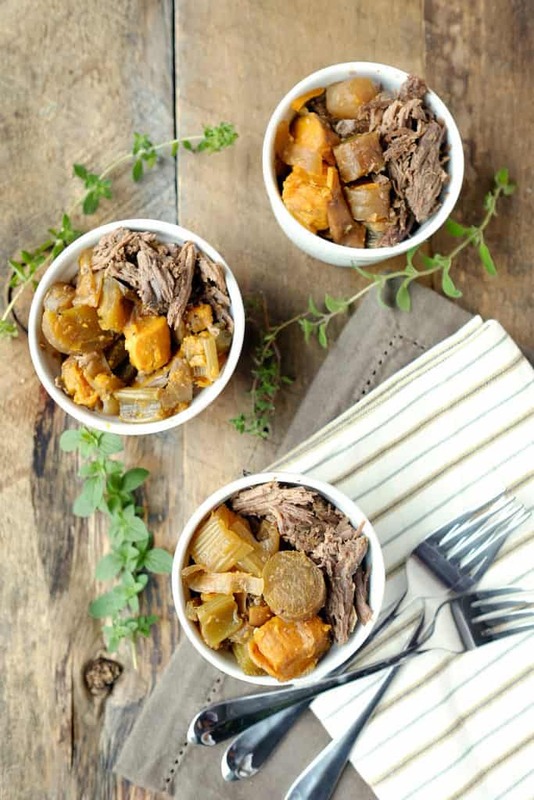 We can’t wait to hear about how you tailor our crockpot beef roast and veggies to fit your family. 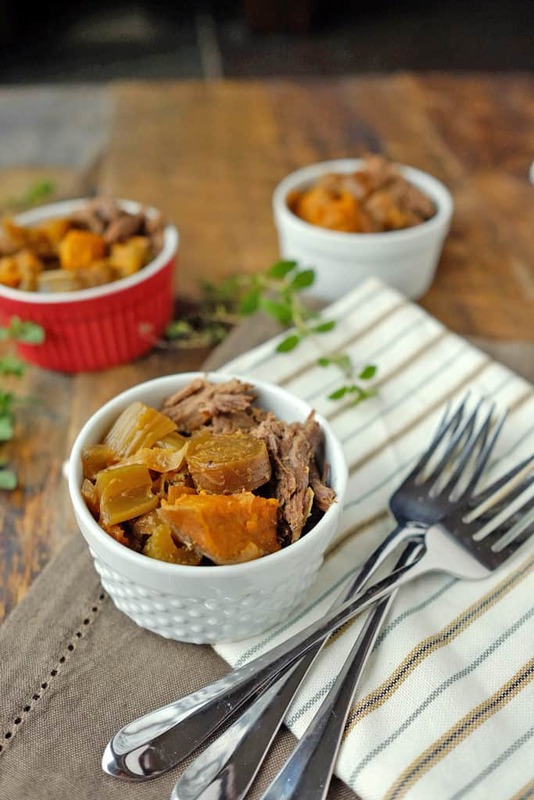 Let us know how you like our crockpot beef roast and veggies by leaving a comment below. Also, take a picture and tag it on Instagram @realsimplegood so we can check it out! If you have the time, cover and refrigerate the meat for 3 hours or as long as 24 to let the rub set in. If you don't have the time, just season the beef and start cooking. Place the beef into the crockpot, pour the bone broth in around the beef without pouring it on the beef and removing the seasoning. Do you think that if i cooked on high in the slow cooker i could reduce the time by a couple of hours? I find that the carrots are as cooked for this time on low. Hi Tae – We haven’t tried cooking it on high because we prefer to cook a roast “slow and low”. However, you can generally half the cooking time when cooking on the high vs. low setting. Alternatively, you could cook it on low and just add the carrots in halfway through so they don’t get cooked as much. If you try either way let us know how it turns out! Any problem with searing the meet first? That’s what I usually do when making a crock pot pot roast. There’s no problem with searing the meat first, we just didn’t do it with this recipe to save time. We hope you like it! Hi I would like to have hubby and I have a go at this for one dinner and then I could refrigerate the rest for lunch at work. Is this ok to do? Thanks! Has anyone tried it with sirloin roast? That’s all the store had so that’s what I’ve had in for about three hours. I’ve made a lot of crock pot/slow cooker roasts over the years, but this one was absolutely fantastic! I made it with a chuck roast. I’ve never used sweet potatoes instead of white potatoes for this before, and they were delicious. I didn’t know if I should peel them before cutting them into cubes, but they were organically grown so I left them intact, which was a good decision. Your seasoning was perfect. This recipe is definitely a keeper. Thank you. Love it! Thanks for trying the recipe and coming back to leave a review :).